Born in 2002 out of the cultural hotbed that is Cape Town South Africa, Freshlyground have become the musical voice of a nation's adolescent democracy. Featuring members of different ethnicities from South Africa, Mozambique and Zimbabwe their diverse backgrounds have allowed them to weave a musical magic that is highly infectious and undeniably groovy. Beginning with the release of Jika Jika in 2003 Freshlyground have carved out a massive following both in South Africa and around the world. Beginning with the release of Jika Jika in 2003 Freshlyground have carved out a massive following both in South Africa and around the world. Their music - a fusion of rock, jazz and Afro-pop ? has proven time and time again to be a favourite amongst all audiences from young children to their grandparents. The skill and joy with which it is delivered have made them perpetual crossover favourites. 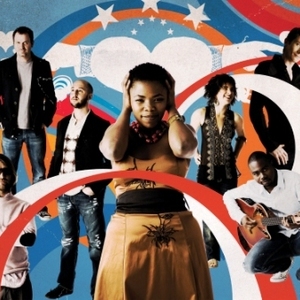 Nomvula, their multi-platinum 2004 release, broke new ground for South African pop acts. Its first single - Doo Be Doo - was the most played song in South Africa in 2005. With four hit singles following it, Nomvula propelled the band to heights few reach. It has taken them to stages and festivals around Asia, Europe, Africa and North America. With 2007's Ma Cheri the band cemented their status as one of the finest acts to have ever come out of Southern Africa. They have won numerous awards including 4 South African Music Awards, 4 Metro FM Awards and an MTV Europe Music Award for "Best African Act" -a first for any SA musician-. Freshlyground have not forgotten their roots in the gritty reality of Sub-Saharan Africa where so many suffer. They have been supporters of the Desmond Tutu HIV Foundation since playing a fund raising concert for the Foundation in 2005. Freshlyground recorded their fourth studio album, Radio Africa, and it was released in South Africa May 2010. During the course of that year they toured extensively throughout South Africa as well as Europe, the US and Asia. Expect ?the most important South African act of the 21st century? to continue winning the hearts of fans and packing venues all over the world.